Force Gauges for Your Testing Needs | IMADA CO.,LTD. Force Gauge is a measuring instrument of Force for Compression, Tension, Peeling etc. A Force Gauge is a measuring instrument of force. It measures force by loading tension or compression force on the tip of the gauge.It is used in QC and R&D fields of a lot of industries such as electric/mechanical component, car, medical, food, packaging and more.→See the applications on each industry. The gauge enables to be used as a simple handheld type measuring instrument or a force tester by combining a force test stand. It provides simple and accurate measurements according to your needs. To fulfill your needs, IMADA has various types of force gauges such as Mechanical force gauge, Digital force gauge, Sensor separate type force gauge etc. They are applicable for wide range of force measurements to realize your testing objectives. One of advantages of IMADA force gauges is the high accuracy. In addition, our force gauges are able to be calibrated according to ISO/IEC 17025 when you necessary. It makes your force test more trustful. Analogue force gauges (Push pull gauges): Easy to read force transition. 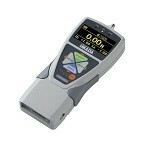 Digital Force Gauge: Easy data management with PC.